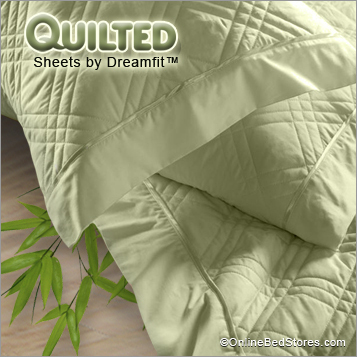 Dreamfit™ Bamboo Rich Quilted Sheets, these incredibly soft quilted sheet sets include one quilted flat sheet, two quilted reversible pillowcases and a non-quilted fitted sheet. Patented strap design on each corner of the fitted sheet and high-performance elastic around the entire perimeter guarantees a great fit on mattresses between 12” to 16” in depth. If you are looking for a stylish, fast easy way to dress up your bedroom, this can now be done with a single sheet set. No need for a bed spread or duvet, when a set of Dreamfit’s Bamboo Rich quilted sheets will get the job done and have your bedroom looking stylishly fashionable. Available Colors: ecru, sage or sand. Available Sizes: Twin, Twin XL, Full, Queen, King, Split King, Cal King, Split Cal King. OBS will only recommend authorized Dreamfit retailers that have years of experience and the longest sales history with the Dreamfit™ brand. Remember the cheapest price may end up costing you the most.